Ringgold Park wasn’t always the beautiful oasis it is today. 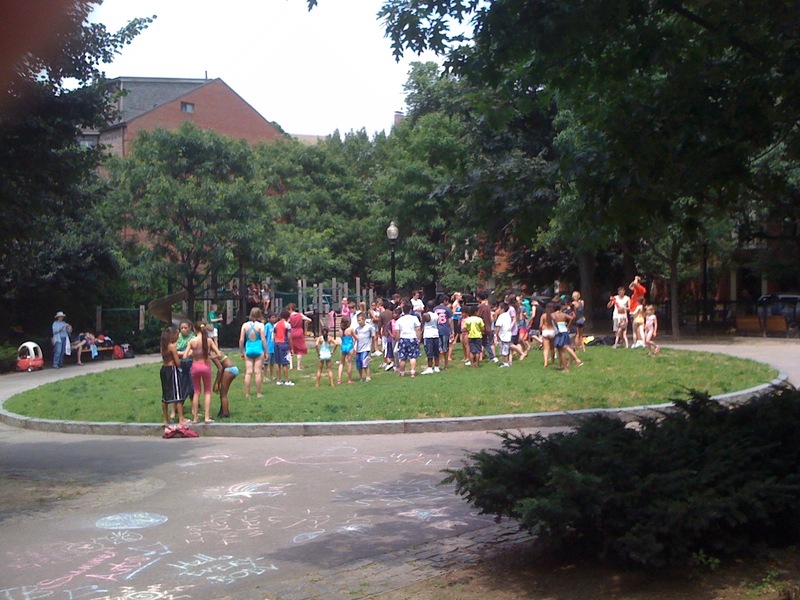 In 2011, as the result of almost a decade of advocacy, community outreach, and fundraising by the Friends of Ringgold Park, the City of Boston completed construction of an interactive yet decorative fountain in the Park’s center, surrounded by granite benches, and flanked by irrigated beds of flowering plants. This fountain replaced a circular area of compacted dirt, which had been primarily used as a dog toilet. At that time, the City also installed low hoop fencing around the perimeter plantings, to protect the plants and the privately-funded irrigation system that the FORP installed in 2007. In 2013-14, the City of Boston renovated the two children’s play areas, completely refreshing the park’s elements and creating the park you see today. The Friends of Ringgold Park and the City of Boston held a total of seven community meetings to discuss the renovation of the center circle, and three community meetings to discuss the playground renovation. The resulting design has something for everybody to enjoy. Ringgold Park is not a historical Victorian park planned by Charles Bulfinch like so many in the South End of Boston. 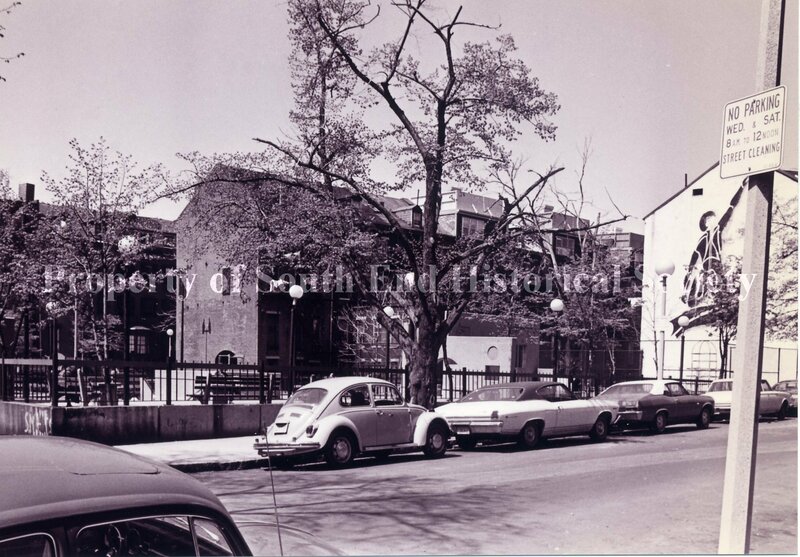 Instead, it sits on the site of the Franklin School on Ringgold Street seen in the photo on the left. The Franklin School burned in a fire in the early 20th century. At some point the abandoned lot was acquired by the City of Boston Parks Department. The founding members of the Friends of Ringgold Park mobilized in the early 1990s. Back then, the park was dominated by a full basketball court, depressed 30 inches lower than the current half court. A 10-foot high chain-link fence surrounded rusting, unsafe playground equipment. The Ringgold Street entryway was flanked by uninviting, high concrete walls. A barren area strewn with the remnants of several picnic tables was the only other feature of the park, which was by all accounts unattractive, poorly lit, and unsafe. In August 1994, the shooting of a 15 year-old youth in the park served as the catalyst to focus grave concerns over the lack of a diverse program in the park, the safety of the aging playground equipment, and the lack of a community gathering space. 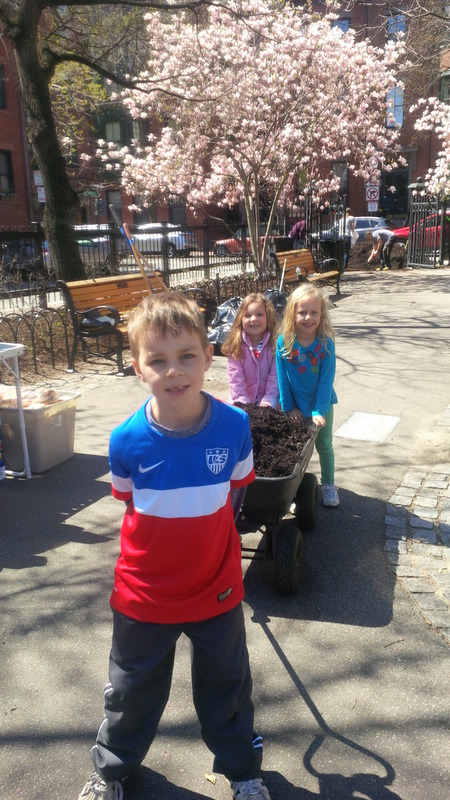 While the young boy survived, this incident fostered a committed, community effort to solicit from the City of Boston the funds necessary for a redesign of the park, which eventually led to the organizing of the Friends of Ringgold Park. Through these efforts, by 1996, the park was renovated, creating two tot lots and a half basketball court. The community had requested a fountain for the center circle of the park, but short of funds, the City installed a circle of grass instead, which quickly deteriorated due to soil compaction and acidification from dog urine. During this time, a group of concerned neighbors worked diligently for the benefit of the community by forming the Ringgold Park Survey Committee. This committee collected information from adjacent neighborhood groups to decide what should be included in the new design. Once the park was programmed, these same neighbors then formed the Ringgold Park Design Committee to work closely with the Boston Parks and Recreation Department. Their efforts guided the design process and presented actual designs by some of the neighbors who included architects and landscape architects. After their instrumental involvement in future direction of the park and implementation, these committed neighbors formed the Friends of Ringgold Park. They guided the future of the park by holding monthly meetings, organizing fundraisers, running clean ups, and establishing the first of many Halloween and Easter celebrations. In 2004, the Friends of Ringgold Park went from a group of dedicated neighbors to a registered nonprofit organization with the goal of continuing improvements to the park and shepherding its necessary maintenance. In pursuit of this goal, the Friends have been extremely busy. 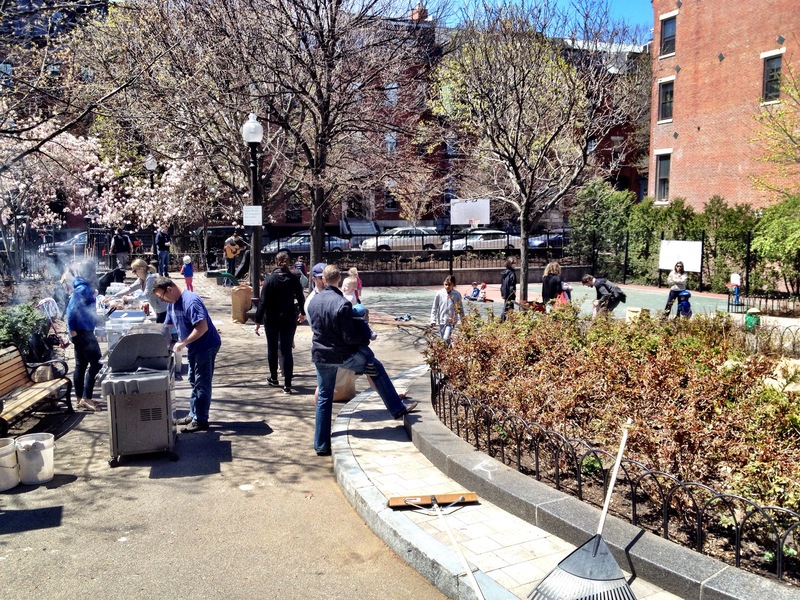 A successful fundraising event in May 2006, along with privately-raised funds through a short lived City of Boston grant program called the Small Changes Program, enabled the Friends to install an irrigation system and new landscaping in the beds around the edges of the park in 2008. After holding an informal community meeting in 2007 to brainstorm ideas for the center circle area, the Friends of Ringgold Park received a Design Development Grant from the Brown Fund (a City of Boston endowed fund) to retain landscape architects, who ran a series of community meetings to develop the fountain plaza design that was ultimately installed in 2012. The design that was developed in these community meetings met the City’s strict requirements, and also met the demands of community members, who wanted a fountain that was both interactive and decorative. Because of the expense associated with manufacturing a custom design, the architects developed a plan in which the benches surrounding the fountain could be upgraded to granite benches, if the Friends of Ringgold Park could raise sufficient funds. The City allowed us to sell engraved pavers to the public, as well as sponsorships of the benches and drums surrounding the fountain. The funds generated by these sales were contributed to the construction of the plaza.